Tom Parker Joins Rudd Company, Inc.
Bryze Joins Rudd Company, Inc.
Seattle, WA – Rudd Company is pleased to announce the appointment of Tom Parker as Vice President of Sales. Parker brings over 15 years of executive sales management experience in the coatings industry, with a strong focus in the wood finishes segment in both floor finishes and lacquer. Parker previously spent 13 years as the Vice President of Sales & Marketing with Lenmar Coatings, a division of Benjamin Moore Company. His 30 year overall career in coatings has also included positions with The Glidden Company/ICI, Minwax, and more recently NanoChem Technologies. Rudd Company, an independent privately held coatings manufacturer, was founded in 1912 and has kept its roots firmly planted in the Northwest, while serving customers throughout the U.S. Rudd Company’s family of brands includes Rudd® wood finishes, Glitsa® wood floor finishes, Rudd® forestry marking paints, SkimStone® decorative concrete finishing system, Milestone™ vertical overlay system, and Encore™ complete countertop refinishing system. For more information, visit www.ruddcompany.com. Seattle,Wash – July 30, 2014 – Ron Bryze, Regional/Training Manager, Rudd Company, Inc., will lead a session in a one‐day forum titled WOOD FINISHING… THE PATH TO PROFITABILITY, sponsored by NueMedia, LLC and IWF. Ron will be speaking on the topic of The Business of Finishing Wood on August 19, 2014 beginning at 8:15 am. Follow the link to read more about the forum and to register for the educational conference. http://iwfatlanta.com/Education/FIN. Bryze has presented specialty finishing seminars for the Centre for Advanced Wood Processing of the University of British Columbia, the Cabinet Manufacturers Association and for the Architectural Woodworking Institute. He has produced numerous training videos and software applications for professional wood finishers and teaches classes on a variety of wood finishing subjects. Bryze is also the author of two books: “The College of Wood Finishing Knowledge” and “Wood Finishing 2.0.” He can be reached at rbryze@ruddcompany.com. Rudd Company, Inc. celebrated its 100th Anniversary in 2012. Rudd Company got its start manufacturing paints, varnishes and wood preservatives for the marine industry. A key focus today is wood coatings with a complete line of solvent and waterborne conventional and pre‐catalyzed lacquers, conversion varnishes, and stains. In addition to Rudd Wood Finishes, the company also produces Rudd Aerosol for the forestry industry and construction trades, Glitsa® wood floor finishes, SkimStone® decorative concrete finishing system, Milestone™ cementitious vertical overlay system and Encore™ complete countertop refinishing system. 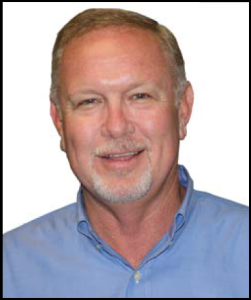 Ron Bryze, Rudd Company, Inc.
Seattle, WA – October 2, 2013 – Rudd Company, Inc., a leader in Wood Finishes, is pleased to announce the appointment of Ron Bryze as Midwest Regional Manager/Training Manager for the Wood Finishes business unit of Rudd Company, Inc. In his new position, Ron will be responsible for further developing the Rudd Wood Finish training program and working with Rudd Distribution partners in the Midwest. Rudd Company, Inc. celebrated its 100th Anniversary in 2012. Rudd Company was founded in 1912 when Donald M. Cummings, great-uncle of the Company’s current Chairman, first started producing paint in the Seattle area. Over the years the Company has kept its roots firmly planted in the Northwest, while serving commercial and OEM customers throughout the U.S.
Seattle, Wash. – May 20, 2013 – Miller Paint is now the distributor of the complete line of Rudd Wood coatings, including stains, varnishes, lacquers, topcoats, and other finishing products, according to a joint announcement released by the companies today. The new distribution agreement marks the first time the two Northwest‐based corporations have partnered to provide a complete line of wood finishing products to professional woodworkers, cabinetmakers, and millwork producers. 50 Miller locations in Washington and Oregon will provide customer support along with the complete line of Rudd Wood coatings. The new distribution agreement pairs two companies that each have long traditions of providing high quality residential and commercial products in the Pacific Northwest. Miller Paint is an employee‐owned company that has been in the decorating business for over 120 years and a leader in their markets. The Rudd Company, Inc has produced Wood Finishes and coatings for more than 101 years. Seattle, Wash. – October 1, 2012 – Rudd Company, Inc. has been celebrating its 100th Anniversary throughout the year and will be topping it off with new color-coded labels for their line of professional wood stains and finishes. Rudd Company was founded in 1912 when Donald M. Cummings, great-uncle of the Company’s current Chairman, first started producing paint in the Seattle area. 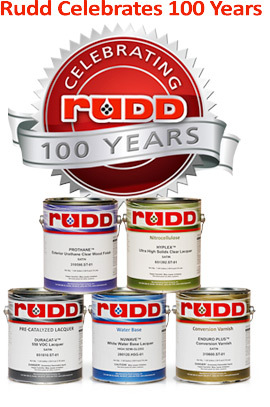 Over the years the company has kept its roots firmly planted in the Northwest, while serving commercial and OEM customers throughout the U.S.
Rudd Company got it start manufacturing paints, varnishes and wood preservatives for the marine industry. A key focus today is wood coatings with a complete line of solvent and waterborne conventional and pre-catalyzed lacquers, conversion varnishes, and stains. The photo above gives you a sneak preview of the new labels that you will be seeing in your locations soon. It is the same quality product as always, just a fresh, new look. The page will host customer photos, comments and questions. The company hopes that the page will be a resource and gathering place of ideas and inspiration. In addition to Glitsa® wood floor finishes, the company also produces Rudd Wood Finishes, Rudd Aerosol for the forestry industry and construction trades, SkimStone® decorative concrete finishing system, Milestone™ cementitious vertical overlay system and Encore™ complete countertop refinishing system. For more information, visit www.glitsa.com. 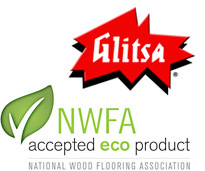 Seattle, Wash. – October 1, 2012 – Glitsa®, a division of Rudd Company has been the first manufacturer to be approved under the NWFA Accepted Product Seal and the NWFA Accepted Eco Product Seal programs for finishes, stains and sealer. The NWFA Accepted Product Seal program identifies wood flooring products that meet or exceed established industry standards. The NWFA Accepted Eco Product Seal, identifies specific products that meet or exceed certain eco-friendly standards. To gain approval for the Accepted Product Seal, Glitsa submitted its product line to testing to ensure it conforms to established third-party testing specifically for finishes, stains and sealers. The product line will be retested and re-documented annually to ensure the standards are continually met. Glitsa’s TruSeal waterborne sealer and its Infinity II and GlitsaSC waterborne topcoats will also be retested according to the standards for the Accepted Eco Product Seal. Rudd Company has been producing Glitsa brand finishes in the USA for more than 50 years. Glitsa produces quality finishes exclusively for the professional wood floor finisher.